Much of U.S. job growth over the past 35 years has been in occupations that require higher levels of education, training and experience, according to a recently released Pew Research Center report. And based on our analysis of official government job-growth projections, that trend seems likely to continue. The differences in projected growth were even more pronounced when looking at social skills, which Pew Research Center defines as encompassing interpersonal skills, written and spoken communication skills, and management or leadership skills. Employment in occupations that require average to above-average levels of such social skills is projected to grow by 8.1%, versus just 4.4% growth for occupations requiring below-average levels of those skills. The strongest employment growth is actually projected to occur in occupations with below-average preparation requirements but higher required levels of social and physical (though not analytical) skills; that group includes such jobs as orderlies, home health aides, physical therapy assistants and bartenders. Those jobs may not pay much – the 2015 median salary for occupations in this group ranged from $19,530 to $56,340 – but collectively they’re expected to grow 13.1% by 2024, about double the overall projected growth rate. In general, though, the jobs that require less education, training and/or experience are the ones expected to grow the least, regardless of what their other skill requirements are. The worst prospects are for the 860,000 or so people working as bank tellers, data-entry keyers, switchboard operators and similar jobs, all of which have average to above-average requirements in analytical skills only and have below-average preparation requirements. Such jobs, as the examples above suggest, are ripe for automation, and in fact many already have been lost to modern technology. If we consider the BLS’s full set of employment projections (which includes 30 or so “catchall” occupations covering an additional 1.5 million jobs), the strongest growth is foreseen for operations research analysts, statisticians, actuaries and other mathematics-oriented jobs: Employment in math occupations is expected to grow by 28%, though that’s off a fairly small base (the group had only 152,400 jobs in 2014). Health care (18.6%), personal care and service (13.1%) and computer and information technology (12.5%) were the other employment sectors with particularly fast projected growth. On the other hand, employment in production occupations is expected to fall by 3.1% by 2024 (representing more than 282,000 jobs), and employment in farming, fishing and forestry occupations is projected to shrink by 5.9%. 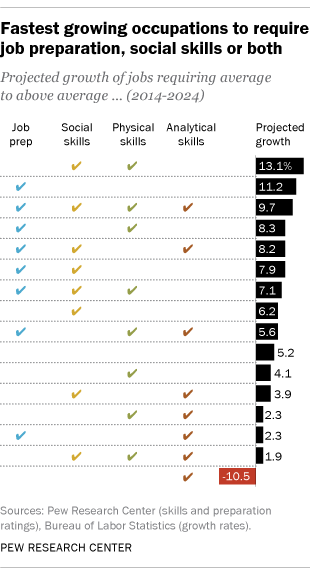 Since education is a key component of job preparation, we also took a closer look at what the BLS deems the typical education level required for entry-level positions in each of the occupations it projected. More than half (55%) of all jobs in 2014 either required no formal educational credential at all or, at most, expected a high-school diploma or its equivalent, according to the BLS. But employment in those occupations is projected to grow only 5.4% by 2024. On the other hand, occupations requiring a bachelor’s degree or higher accounted for less than a quarter of all jobs in 2014, but their collective employment was expected to grow by 8.8% over the following decade. One frequently heard critique of today’s economy, especially since the Great Recession, is that most newly created jobs don’t pay very well. There’s some truth in that: The BLS data indicate that nearly half of the jobs predicted to be created by 2024 are in occupations with median wages of less than $40,000 a year. 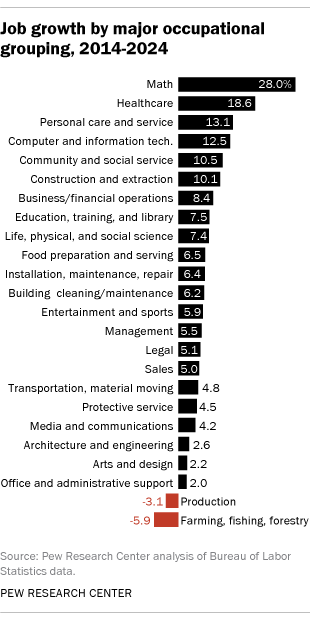 Bear in mind, though, that such occupations already accounted for 59% of all jobs in 2014. 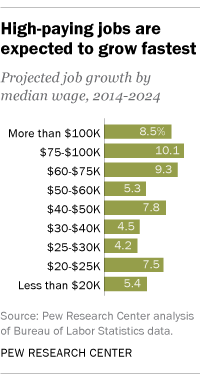 In fact, the fastest growth is projected to come in higher-paying occupations: Those with median annual wages of $60,000 and higher are projected to grow at a combined rate of 9.3%. Those occupations overwhelmingly require higher levels of preparation and above-average levels of social skills, analytical skills or both.